A fresh and stylish low floor city bus has just hit the streets of Rio de Janeiro in Brazil, proving it’s more than a concept vehicle with 200 in operation on the city’s south. Scania Brazil’s Sales Director Wilson Pereira says the new Scania low floor meets the city’s requirements for a fast developing passenger network, and a requirement for an attractive bus. "I see a huge future potential," says Pereira. 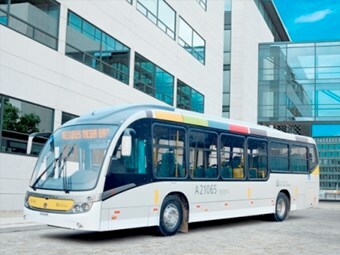 "Upcoming major international sports event, like the Soccer World Cup 2014 and the Olympics in 2016 will further increase the demand of reliable and comfortable buses," he says. The Scania city buses, which will be operated by the Breda Rio Group, have been designed to improve urban mobility in the municipality. Pereira says vehicles bring a concept which is completely new to Rio de Janeiro when it comes to urban passenger transport, which is that of focusing on the maximum of comfort and accessibility. The low floors are Scania K 230 4x2 at 12.5 m long fitted with 35 seats, space for 47 standees and one wheelchair. The Scanias are now operating on Rio’s Bus Rapid Transit network, one of the world’s largest and most sophisticated systems. Rio de Janeiro already has three rapid transport lines in operation in the city’s south zone which cut 40 percent in travel time off non-BRT routes. A Scania Australia spokesman says it’s unlikely the Rio low floors will be seen in this country in the near future due to non-compliance of the 2.5 metres maximum width rule.